Current U.S. Territory and potential 51st state, Puerto Rico boasts 349 bird species, including 17 or so endemics, as well as the second highest alcohol consumption per capita in the world, behind only Russia. Sara and I traveled there in November 2004 for a weekend wedding, but also attempted a whirlwind tour of the northeastern end of the island. 349 birds and less than 48 hours… so much to see, so little time! We stayed in the tastefully appointed Intercontinental San Juan Resort and Casino in the Isla Verde section of Puerto Rico. To be fair, the Intercontinental is more hotel than resort. The Intercontinental offered plenty of amenities that we had no time to enjoy and an ocean view that we enjoyed quite a bit, though I’ve never seen an ocean so untroubled by bird life. Maybe this should have been a sign. Despite the nagging sense that this ‘vacation’ might be more relaxing if we actually slept a bit, we rose early to embark on a brief rainforest tour. Our first task, however, was to partake of a breakfast hearty enough to sustain us through the day. We eschewed the overpriced options at the Intercontinental Resort and took to the streets for local fare. To our understandable regret, the best we could do was Denny’s. At least we got a sense of the local flora and fauna on the way. 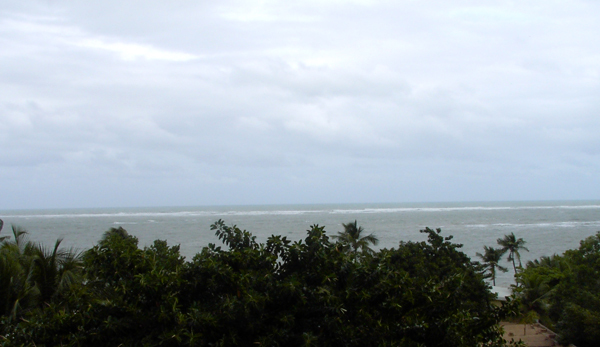 The first two Puerto Rican birds we saw, and this should come as no surprise, were a grackle and a dove. The good news, however, is that we were looking at a Greater Antillean Grackle and White-winged Dove. Two new birds before breakfast, and we were just getting started. On our way back to the resort, we enjoyed great looks at another new pigeon, the Zenaida Dove, along with the ubiquitous Rock Pigeon and Northern Mockingbird. We also saw for the first time the surprisingly common Gray Kingbird. This handsome, stout-billed fellow is much chunkier than his Eastern cousin and can be spotted singing from any tree in town. I’m not sure how well the Gray Kingbird thrives in the wild because we only saw them in the city. The last bird we picked up in Isla Verde was also the best looking. 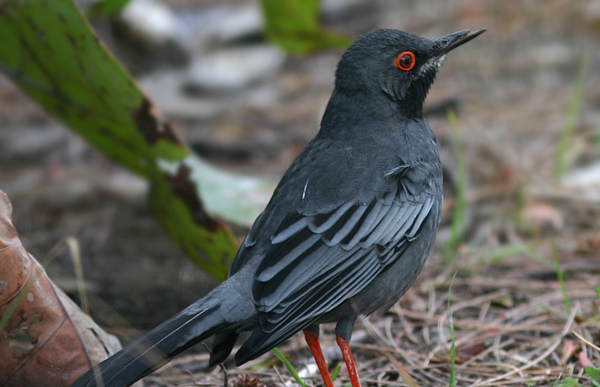 The Red-legged Thrush seems to be the native equivalent to our American Robin. The comparison hardly does the zorzal de patas coloradas, as it is sometimes called locally, justice since this thrush is much more striking than the smaller robin. The red-leg is a conservative gray in color, darker above and lighter below, with a patch of black and white streaks from chin to throat. Its most arresting features are, as one might surmise, its legs which along with its eyering and occasionally its beak are what I can only describe as a vibrant vermillion. This vivid color etches itself in one’s retinas and memory. For a common bird, this species is a beauty. Was the Red-legged Thrush photo shown above taken in Puerto Rico? Looks like a variant that is not common at all here. Where Are You Birding this Third Weekend of May 2009? Where Are You Birding This Second Weekend of July 2013?